Parasound introduces new Halo JC5 stereo amplifier | What Hi-Fi? Based in part on the JC 1 monoblock, the Halo JC5 power amp costs £6999 and is available now. 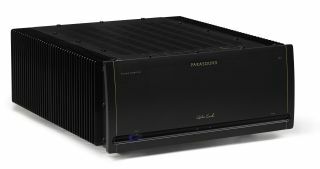 Parasound has announced a new £7000 stereo power amplifier, the Halo JC5. Designed using the "essence" of the JC 1 monoblock, but with two channels squeezed into a single chassis, the JC5 has high bias Class A/AB topography capable of delivering 400 watts per channel. According to the company, those 400 watts per channel are at an eight ohm rating. 600 watts per channel can be delivered into four ohms, while 1200 watts can be bridged to mono at eight ohms. Parasound founder and president, Richard Schram, comments: “the new JC5 is a remarkable amplifier that creates a new sweet spot in our Halo product family. Our customers often tell us they love everything the JC 1 offers while wondering if we could deliver comparable performance in a no-compromise stereo power amplifier, to save them money and space...the result has exceeded everyone's expectations."